After the secession of the Confederate states, the remaining States in the Union faced the strategic challenge of enforcing the restoration of the Union by military force. 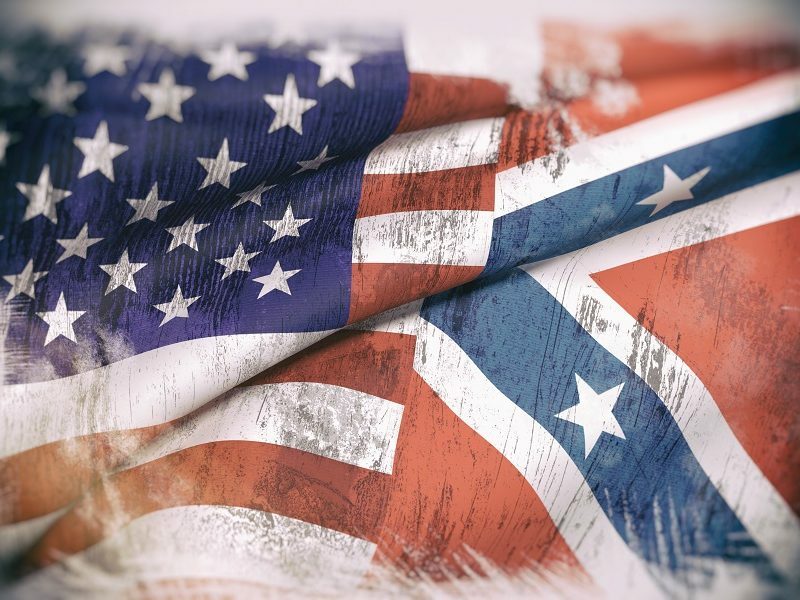 Political expedients had failed repeatedly and the federal government could not recognise the existence of the Confederacy or instigate diplomatic approaches to end the conflict without sacrificing its fundamental principle of indivisible Union. Passivity to Southern secession would tacitly accept the existence of, and recognise by default the sovereignty, of the Confederacy. Therefore the Union was compelled to adopt an aggressive military strategy to invade and occupy the seceded (or, as they saw it, rebellious) states by armed force and compel the dissolution of the Confederate government. The United States’ Army and Navy were inadequate to undertake a strategic offensive on a continental scale. The US Regular Army was small and not prepared or equipped for major campaigns, and it was struggling to adapt to or adopt technological advances that were transforming the way wars would be conducted in the coming decades. The US Navy was small and was at risk of obsolescence at a time of rapid change in maritime technology and affairs. The scale of the strategic imperative for an invasion and occupation demanded the creation of new and large land and sea forces. The United States in 1861, just as in the Mexican War of 1848, met the need to expand its military force by creating very rapidly a new and temporary army of volunteers that would be of sufficient size to conduct operations over immense distances and to hold it against a determined enemy. A corresponding expansion in naval forces would also be required to enforce a blockade and to provide access to the southern states by sea and river. New armies of novice soldiers could be recruited, trained, and at least partially equipped comparatively quickly by the powerful Northern economy. However, it would take much longer for them to attain the competence to carry out decisive or even efficient operations over long distances and against a highly motivated enemy – and to secure the ground it occupied. The initial appeal for 75,000 volunteers appeared excessive to many early commentators but this force quickly proved to be only a tiny fraction of the force eventually required for victory. Few recognised at the time the genius of General-in-Chief Winfield Scott’s “Anaconda Plan” announced in 1861, which foresaw the need to constrict the Confederacy through a tight blockade by sea and control of the navigable Western Rivers; this would accompanied by a gradual dissection of Confederate territory and subjugation of the Confederate armies and people by large military expeditions. This plan required time to execute but after four years of war the broad outline of the Anaconda Plan – executed with increasing ruthlessness and requiring the application of force on an unimagined scale – successfully delivered a decisive victory. The Union enjoyed naval superiority from the outset of the war and this was only rarely and briefly threatened. While the capacity to land and sustain armed forces by sea and river was initially small, combined operations began quickly and eventually grew to have a decisive significance. The challenge for the Union commanders was to decide where such operations should be concentrated and in what priority, and how to equip and direct them. The first requirement was to build a navy large enough to enforce a blockade of the Southern coasts and ports. There were comparatively few good Southern ports and fewer with naval or ship-building facilities, which meant that opposition on the high seas was not likely to be great. However, the difficulties of sustaining large blockading fleets continuously at sea remained to be surmounted. The naval bases saved or quickly recovered from Confederate occupation at Fort Pickens (near Pensacola, Florida), Key West, the Dry Tortugas, and Fortress Monroe (in Chesapeake Bay) were supplemented in 1862 by bases established on offshore islands and by the gradual capture of ports in North Carolina, South Carolina, Louisiana, and elsewhere. The early capture of New Orleans and the opening of the mouth of the Mississippi accelerated progress. It is inconceivable that the Union armies could ever have entered, advanced, or occupied the key strategic points of the Confederacy without gaining control of the seas and rivers. Railroad lines (despite frequent destruction and reconstruction) provided the supply lines for the armies as they penetrated the southern interior beyond the reach of warships and river transports. Railroads dictated the direction of operations and the risk of their severance was a ceaseless source of anxiety for the Union armies. In the final campaigns, the combination of military ascendancy and the growing ability and confidence to operate away from these iron umbilical cords liberated the Union armies to achieve the final dismemberment and dissolution of the Confederacy. President Abraham Lincoln strove to assert his authority as Commander-in-Chief but he contended throughout the war with fierce political enemies and intractable factions on all sides. Early in the war, he was tempted to interfere in the conduct of the war at an operational level, sometimes to the point of undermining the operations of his generals. The political urgency for the Union to launch the offensive and to maintain the strategic initiative meant that in the early months and years some Union commanders felt they were sometimes forced into premature action with ill-prepared forces. Others could not be persuaded to act with dynamism even when their forces appeared ready and sufficient. A series of commanders were elevated to senior commands only to be discarded, sidelined, or tolerated until more competent leaders could emerge. Later leaders had learned their craft as commanders by practical experience and, additionally, they could now rely on increasingly competent staff officers, battle-tested field officers, a core of robust and resourceful soldiers, and an increasingly efficiently logistical, transport, engineering, and support infrastructure. All of these staff and line functions were created, adapted, and innovated continually throughout the war so that the grim, agile, and relentless, armies of 1865 bore little resemblance to the enthusiastic but fragile crowds of 1861. Lincoln gradually learned about the principles of economy and concentration of force and the need to coordinate operations in and between the different theatres. At the start of the war few commanders could manage or sustain extensive operations and they had little or no prospect of coordinating them between theatres or even sectors, but by 1864 the Union high command was beginning – with growing success – to coordinate the operations of entire departments, armies and fleets. Once Lincoln had identified a core of leaders he could rely on, he allowed them increasing autonomy so long as they cooperated to achieve shared objectives. Lincoln’s growth as a political leader coincided with improvements in his management of his generals and admirals. Alongside a core of commanders who had proved themselves at lower levels in 1862 and 1863 and had progressed to senior leadership positions in 1864, he also found skilled administrators to provide the armies and navy with the practical and modern necessities of war, and to assist their coordination. The North prized inventiveness and new weapons and techniques gradually added a sharper edge to their armies. The martial ardour and determination of Southern forces often overcame the Union armies early in the war but as the Confederate capacity to conduct the war was eroded, the growing competence and logistical capacity of the Union gradually tipped the scales in favour of the North. The Union high command evolved an increasingly sophisticated and efficient command structure for its armies and fleets. The army of 1865 – despite increasing vulnerability in the quality and morale of conscripts and recruits – was large, modern, well-organised, competently-led, and efficient. It could move large forces quickly and decisively, along conventional supply and transportation lines or apart from them, and conduct operations over unprecedented distances and durations. At the same time, the Confederate armies were ground down by want and attrition to a shadow of their earlier glory and slowly lost the capacity to sustain major mobile operations over long distances. After a series of painful errors, false starts, embarrassing defeats, unnerving ebbs and flows in enthusiasm for the war, and fluctuating performances by leaders on and off the battlefield, the United States finally exerted its economic and material superiority to project military power almost at will and across huge distances. The Union had also honed its high command to wield these forces decisively and intelligently at the strategic, operational, and tactical levels. After learning the lessons of blood and fire in 1862 and 1863, by 1864 the Union was ready to compel by force the return and reconstruction of the Southern states. The foundations for victory were built in 1864 and success was accomplished rapidly when the 1865 campaigning season began.